This entry was posted in Travel, Travel Photos and tagged 50 Year Project, Africa, Blog, Blogging, Botswana, Life, Lions, Nature, Okavango Delta, Photography, Travel, Travel Blog, Travel Journal, Travel Photo, Wildlife. Bookmark the permalink. Yes. I feel like that today. I dare you to give him a belly rub. Double dare you. OMG he looks like a bigger version of MasterB! If you saw him in the wild you would see a lot of similarities. I was amazed. Does he hide behind things waiting to leap out? I didn’t see that, but I bet he does. Is MasterB still playing the hunter game? Att gave up on that years ago. MasterB loves to play, and yes he practises his hunting skills on me, and increasingly his fighting skills too. Fighting skills…I need to see that. Is he gentle? Att will playfully kick me, but never has his nails out. Not as gentle as he was. I think he has had to learn how to defend himself in the great outdoors. But he does stop when I say ouch, whereas Cat used to give me a look of withering contempt making it clear he thought I was a total wimp. a look of withering contempt–this sounds like Att’s normal look. Att is throwing a fit right now since he’s on a pile of papers I’m working on. he wants them for a bed. I may lose a drop or two of blood before this is done. They can be. At night though he’s patrolling the perimeter of his territory from intruders. We have seen them hungry for food and roaring. Quite the opposite to this lad in your photograph! We heard one roar and wow it’s loud and somewhat terrifying. Doesn’t he look passive and gentle? I’m amazed that you captured such a moment. Great job!! He doesn’t look like a killer cat, just a typical house cat–but large. LOL – that’s an awesome shot! 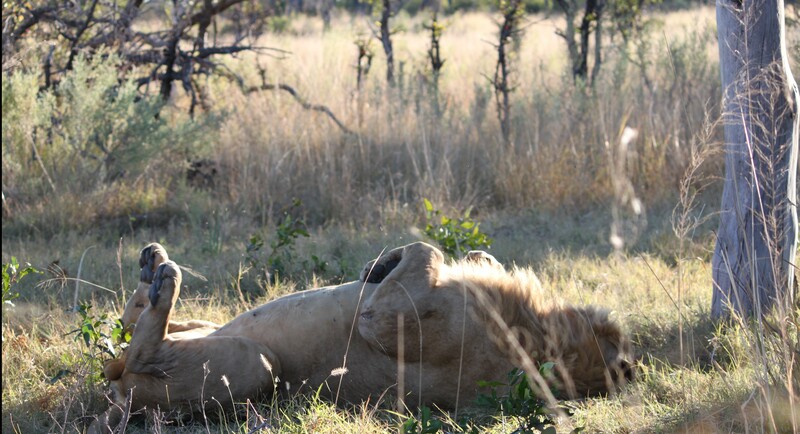 He looks like he is enjoying the warmth from the sun…and wanting a nice rub on the tummy. I have to admit when you see him like this it’s tempting to rub his belly. Then I remember all the shows I’ve seen and how fierce he can be. I stayed in the jeep. Surprising to see in the wild. Ahhhhh…or was he scratching his back?! Maybe in his sleep. Or dreaming. It was amazing to see how wild cats and domestic cats have many of the same characteristics.